The big day is finally here for Selina and Bruce in Batman #50. Sort of. You’ve probably heard at this point about the big reveal of Batman #50's wedding thanks to The New York Times, continuing its weirdly consistent streak of getting to spoil comics days before they release. But, for better or worse, there’s more to the issue than what happens at DC Comics’ biggest wedding of the year. Out of the context of the issue, the fact that Batman and Catwoman do not get married in Batman #50, as spoiled by the NYT, isn’t great. It speaks to one of superhero comics’ greatest weaknesses, a sheer refusal to let its biggest stars grow as characters and change fundamentally—a world of impermanence, where the repeated arrival of new creative teams means resets and reboots and the fact that not even death itself can stick for a character as big as Batman. 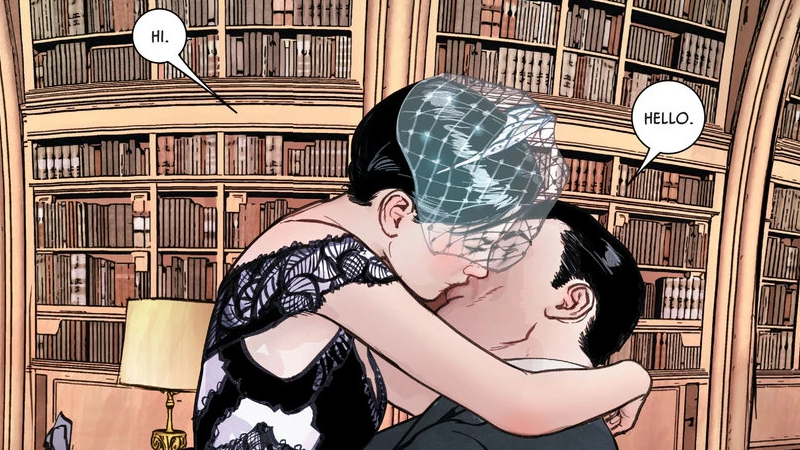 But you should still read the new issue by Tom King, Mikel Janin, June Chung, Clayton Cowles, and a veritable church-load of special wedding guest art teams who provide splash panels recreating Bruce and Selina’s relationship over the years—because while it might not be matriomonial bliss, it’s an important moment in this take on the characters. Batman #50, out today at long last, is a step in an emotional journey that Bruce and Selina have been on for dozens of issues. King’s series has played a long game with Gotham’s Dark Knight, one that has seen him more emotionally vulnerable—and emotionally available—than we would typically expect of the character. That lone wolf persona has shielded Bruce from a world of hurt for decades, but little by little over the course of King’s run we’ve seen that shield chipped away, and in the case of Selina Kyle, break down altogether. The Bat and the Cat set an impromptu scene for their would-be-wedding. Their openness with each other forms the heart of Batman #50's structure. The event of the wedding itself is actually fairly incidental to the issue—Bruce and Selina casually decide to meet up on a random rooftop at dawn, bringing a very drunk judge and one personal witness each (Bruce chooses Alfred, who gets some heartbreaking moments in this issue; Selina, her longtime friend Holly Robinson). Most of the issue is instead framed in a similar manner as to how King presented his stunning love letter to Batman and Superman’s friendship in Batman #36, two mirrored soliloquies which are actually letters Bruce and Selina wrote to each other for their wedding. As in Batman #36, this parallelism is utilized to represent the deep bond Bruce and Selina share, emphasized by the fact that their thoughts and word patterns are as intertwined as they have become. But the subject of both letters gets across the journey Bruce and Selina have been on since they confessed their love to each other. It is about the truth they see in each other, laid bare by their love—and the fact that Selina’s true self has always been on display, an act of defiance against the world, and that Bruce’s truth has been hidden under his mask, never shared with anyone until now. Selina discusses the eyes hidden beneath Bruce’s mask in her letter to him. But it’s in that truth that Selina finds something disconcerting—that deep down, Bruce Wayne is still the traumatized little boy who lost his parents, that that tragedy still continues to define him. It’s that truth, and comments from Holly about the absence of happiness being core to Batman as an identity—echoing the Joker’s own warnings to Selina in Batman #49—that cause Selina to make her heartbreaking decision: ditch the wedding, sacrificing a happy life with Bruce so Batman can continue to be the brooding hero he has been for nearly 80 years. What does a Batman who is happy look like? Can a happy Batman even exist? Selina has seen over the course of her romance with Bruce that deep down his trauma is still fundamental to who he is as a person. If she helps alleviate that simply by loving him, does who Bruce Wayne is become altered too? She doesn’t feel like she can answer that question herself, which is why she ultimately chooses to sacrifice their happiness together to ensure that Batman can remain as Batman has always been. The real tragedy, however, is in Bruce’s letter rather than the lack of nuptials—because it reveals that despite Selina’s own concerns, Bruce himself was not just open, but willing to change. He tells her in his letter that it’s her place in his life that’s made him ready to grow beyond a boy who lost his parents, a boy who singularly focused his entire livelihood in reliving that loss to enact justice so others would never experience it in the first place. There’s a beautiful line where Bruce describes it as living a life that is undefined, just as Selina has—a life where Bruce can really begin to grow beyond the child he still really is, in a lot of ways, thanks to the robbing of his innocence all those years ago. Bruce longs for a life undefined by his trauma in his letter to Selina. It would’ve been a future, at least, where Bruce still thought he could’ve been Batman anyway. In a touching moment with Alfred as he reveals to the prim-and-proper butler that the wedding will take place on a random Gotham rooftop, Bruce acknowledges that the choice is a romantic one. A rooftop, after all, is where Bruce and Selina have spent their lives as a vigilante and a thief respectively—and they’d still be there going forward, patrolling together as Batman and Catwoman. So for all Selina’s doubts, for all of Holly’s and the Joker’s, as to whether or not there could a Batman who is happy, Bruce Wayne himself seemed more than ready to accept that future himself. But it’s not a future he’ll get now, at least not quite yet. Beyond the emotional journey Bruce and Selina go on through their mirrored letters, there’s one final twist to the tale of Batman #50 that makes things a whole lot messier. After Selina never shows up to the rooftop, it’s revealed that Holly has been a pawn in a game played by Bane (and a host of other Bat-Villains, including, surprise, a very much alive Joker!) ever since the events of “I am Suicide.” By getting Holly, and to a certain extent the Joker, to make Selina doubt a future where she and Bruce are happy together, it would seem that this time around Bane is planning to break Batman emotionally, instead of just physically. Character growth! It’s not just for men in Bat-masks. Even Skeets was in on this!? There is still much more of this relationship to tell—Batman #50 makes it clear there’s more going on between Bruce and Selina, not just because of whatever machinations Bane has to break the Bat once more, but with the underlying heart of their relationship. Especially so for Bruce himself, who—after decades of seeing his life of isolation as the Dark Knight as less of a life and more of an eternal damnation for a traumatized little boy—was finally ready to change and grow beyond the event that has defined his entire persona. Will he still be willing, after Selina’s choice to deny both herself and Bruce the life they wanted together, or will he retreat back into the mask he’s been able to hide under all his life? Is Selina willing to accept that that change could, yes, mean that Batman as we’ve known him would be gone forever—replaced by the almost alien thought of a Batman with some semblance of happiness? Time will tell. Tom King has previously described this wedding at merely the halfway point of an arc destined to stretch out over a hundred issues—so while today might not be the day for Batrimony, there’s still plenty of story here to uncover that could, eventually, lead to it actually happening somewhere down the line. There’s always a rooftop. There’s always a Bat. And there’s always a Cat... no lighthouses though. That would be silly. There’ll always be a rooftop in Gotham waiting for the Bat and the Cat, should they choose to do so. After all, that’s where they’ve always been, really.